Madame Ching or Ching Shih (1775–1844):65 (simplified Chinese: 郑氏; traditional Chinese: 鄭氏; pinyin: Zhèng Shì; Cantonese: Jehng Sih; "widow of Zheng"), also known as Cheng I Sao (simplified Chinese: 郑一嫂; traditional Chinese: 鄭一嫂; pinyin: Zhèng Yī Sǎo; Cantonese: Jehng Yāt Sóu; "wife of Zheng Yi"), was a prominent pirate in middle Qing China, who terrorized the China Sea in the early 19th century. She personally commanded over 300 junks manned by 20,000 to 40,000 pirates:71—men, women, and even children. The rest of her fleet, commanded by her subordinates, had more than 1,500 vessels with a crew upwards of 180,000. She entered into conflict with the existing empires of the time, such as the British, Portuguese and the Qing dynasty. She was one of the few pirate captains to retire from piracy. She is considered to be the most successful female pirate and one of the world's most powerful pirates in history. Ching Shih has been featured in numerous books, novels, video games, and films in Asia. She was born Shi Xianggu (Chinese: 石香姑; Jyutping: sek6 heong1 gu1, IPA: [sɛk˨ hœŋ˥ ku˥]) in 1775 in Guangdong. She was a Cantonese prostitute who worked in a small brothel in Guangzhou, but was captured by pirates. In 1801, she married Cheng I, a notorious pirate. The name she is best remembered by simply means "Cheng's widow". Cheung Po Tsai was the son of a fisherman and had been impressed into piracy at age 15, when he was captured by Cheng I. Cheung rose rapidly through the ranks and was eventually adopted by Cheng I to give him the Rights of a son and heir. As soon as Ching Shih chose Cheung, she acted quickly to solidify the partnership with intimacy. The two became lovers within weeks and eventually married. Ching Shih gave birth to Cheung's son sometime between the ages of 32 and 35. Cheung Po Tsai died at 36, causes unknown. Once she held the fleet's leadership position, Ching Shih started the task of uniting the fleet by issuing a code of laws. :28 The Neumann translation of The History of Pirates Who Infested the China Sea claims that it was Cheung Pao Tsai that issued the code. Yuan Yung-lun says that Cheung issued his own code of three regulations, called san-t'iao, for his own fleet, but these are not known to exist in a written form. The code was very strict and according to Richard Glasspoole, strictly enforced. First, anyone giving their own orders (ones that did not come down from Ching Shih) or disobeying those of a superior were beheaded on the spot. Second, no one was to steal from the public fund or any villagers that supplied the pirates. Third, all goods taken as booty had to be presented for group inspection. The booty was registered by a purser and then distributed by the fleet leader. The original seizer received twenty percent and the rest was placed into the public fund. Violations of other parts of the code were punished with flogging, clapping in irons, or quartering. Deserters or those who had left without official permission had their ears chopped off, and then were paraded around their squadron. Glasspoole concluded that the code "gave rise to a force that was intrepid in attack, desperate in defense, and unyielding even when outnumbered." The fleet under her command established hegemony over many coastal villages, in some cases even imposing levies and taxes on settlements. According to Robert Antony, Ching Shih "robbed towns, markets, and villages, from Macau to Canton." The Red Flag Fleet under Ching Shih's rule could not be defeated—not by Qing dynasty Chinese officials, not by the Portuguese navy, and not by the British. She even captured Richard Glasspoole, an officer of the East India Company ship The Marquis of Ely, and seven British sailors in 1809. 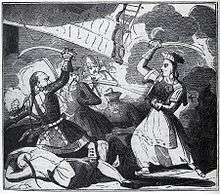 But in 1810, amnesty was offered to all pirates, and Ching Shih took advantage of it. She ended her career that year, accepting an amnesty offer from the Chinese government. She kept her loot, and opened a gambling house. A semi-fictionalized account of Ching Shih's piracy appeared in Jorge Luis Borges's short story The Widow Ching, Lady Pirate (part of A Universal History of Infamy (1935)), where she is described as "a lady pirate who operated in Asian waters, all the way from the Yellow Sea to the rivers of the Annam coast", and who, after surrendering to the imperial forces, is pardoned and allowed to live the rest of her life as an opium smuggler. Borges acknowledged the 1932 book The History of Piracy, by Philip Gosse (grandson of the naturalist Philip Henry Gosse), as the source of the tale. In 2003, Ermanno Olmi made a film, Singing Behind Screens, loosely based on Borges's retelling, though rights problems prevented the Argentine writer from appearing in the credits. Afterlife, a 2006 OEL graphic novel, depicts Ching Shih as a guardian who fights demons to protect the denizens of the underworld. In The Wake of the Lorelei Lee, book eight of L.A. Meyer's Bloody Jack series, Jacky is captured by Ching Shih and so impresses her that the pirate bestows her with a tattoo of a dragon on the back of her neck to indicate she is under Shih's protection. In 2007, in the third film in the Pirates of the Caribbean franchise, Ching Shih was portrayed as the powerful pirate Mistress Ching, one of the nine Pirate Lords. Puppetmongers Theatre of Toronto, Canada, mounted two different productions based on Ching Shih's life. The first was a co-production with the Center for Puppetry Arts in Atlanta, directed by Jon Ludwig in 2000, and the second version, directed by Mark Cassidy played at Toronto's Tarragon Theatre Extra Space in 2002. In the 1990s, the Treasure Island Hotel and Casino in Las Vegas, NV had a Chinese restaurant named after Ching Shih (Madame Ching's). It is no longer in business. In the 2015 Hong Kong television drama Captain of Destiny, Maggie Shiu plays a character who is based on Ching Shih. Red Flag, a limited series which centers on Ching Shih, starring Maggie Q and Francois Arnaud, was scheduled to start filming in the fall of 2014 in Malaysia. 1 2 3 4 5 6 Murray, Dian (1987). 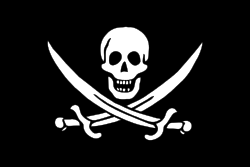 Pirates of the South China Coast, 1790-1810. Stanford University Press. ISBN 0-8047-1376-6. 1 2 3 4 5 Yuan Yung-lun. Ching hai-fen chi (Record of the Pacification of the Pirates). 1 2 3 4 Maughan, Philip. "An Account of the Ladrones Who Infested the Coast of China". Further Statement of the Ladrones on the Coast of China. ↑ Murray; Dian; Pennell. "Cheng I Sao in Fact and Fiction". Bandits at Sea: A Pirates Reader. p. 260. 1 2 Glasspoole, Richard. "Substance": 44–45. 1 2 Turner, J. "Account of the Captivity of J. J. Turner, Chief Mate of the Ship Tay, Amongst the Ladrones": 71. ↑ Antony, Robert (2003). Like Froth Floating on the Sea: The world of pirates and seafarers in Late Imperial South China. Berkeley: University of California Press. ↑ Gail Selinger; W. Thomas Smith, Jr. (2006). The Complete Idiot's Guide to Pirates. Alpha Books. p. 338. ISBN 978-1-59257-376-9. ↑ C.R. Pennell (1 April 2001). Bandits at Sea: A Pirates Reader. NYU Press. p. 261. ISBN 978-0-8147-6679-8. 1 2 Koerth, Maggie (2007-08-28). "Most successful pirate was beautiful and tough". CNN. Retrieved 2007-08-28. ↑ Borges, Jorge Luis (1972). A Universal History of Infamy. Dutton. ↑ Weissberg, Jay (23 October 2003). "Singing Behind Screens". Variety. ↑ "Francois Arnaud To Co-Star In Limited Series 'Red Flag'". Deadline Hollywood. 28 March 2014. Retrieved 14 October 2016.